So it’s our last full sea day, and ’formal dress’ tonight (called Black Tie Optional), only the second we have had on this cruise. The sun is shining so we are off to spend a day on the sun decks! The wonderful deck stewards kept us topped up with champagne, and we ate lunch around the Trident Pool area. Great food and great for people watching too! So after a full day in the sunshine, (our first sun since leaving Copenhagen, we had to make the most of it! ) 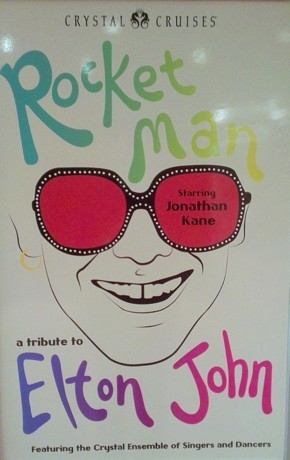 we attended the Elton John tribute show called Rocket Man. Crystal cruises have flown in guest performer Jonathan Kane to perform it and he did a really great show, accompanied by the ships singers, dancers and the orchestra. Great show and really lively! This show only appears on Crystal Serenity, and if you are cruising on this ship then do watch this show! After this it was upstairs for the Captain’s Farewell Cocktail party, followed by dinner then up to Pulse nightclub for a final karaoke session. It was very busy in Pulse, this our last proper night on board, where had all these people been for the rest of the cruise? Lots of participation, singing, dancing and general fun! Paolo, our fave bartender kept us topped up with an assortment of delicious cocktails till about 2am! So after yesterday’s sun-a-thon, today was bright and breezy with blue skies punctuated with clouds, nice but not sun bathing weather! Spent the day at the final Seth Shostak lecture "Could the Aliens Be Here?" another entertaining and informative talk, and looking at the art produced by the participants in the Odyssey Art at Sea programme. One of our new friends from Pulse had a few pieces in the exhibition and they were really rather good! The afternoon was spent packing, never a fun job, and a contrast to when you are packing to go on a cruise, filled with excitement; packing to go home is filled with sadness! Due to the high winds and strong currents we docked about three hours later than planned, and arrived into Stockholm at 10pm. As we were supposed to dock at 7pm, there was no planned show; however the Cruise Director and his team put together a 30 minute show that I thought was very good - and goes to prove that Crystal Cruises put their guest’s needs first. Tomorrow we have a late checkout, 9:40 am - we have booked the Crystal Cruises transfer that included a day room at the Sheraton Stockholm hotel, all for $30 pp. I thought this was excellent value for money, and allowed us plenty of time to explore the city whilst our luggage and hand luggage was all secure. We had an amazing cruise on board Crystal Serenity - the scenery and ports of call were all excellent (apart from Murmansk, but still good to have gone there). The weather, even though it was not sunny, added to the atmosphere of many of the destinations, with the low mist and dramatic skies. The ship was great with spacious public rooms and of course our wonderful penthouse accommodation, with its super comfy bed and innovative lighting system. My waistline is evidence of the delicious food on board! The staff and crew are what made the cruise for me; the deck stewards who greeted us by name whenever we saw them, the happy smiles and genuine warmth of other crew members, the bar staff who kept us topped up with our favourite drinks without having to ask - all added up to make this a cruise to remember. Below is a link to a compilation of photos from the ports of call from this North Cape and Beyond cruise. I hope you enjoy them as much as I did taking them! If you would like to take a similar cruise, please contact us to discuss your options.